If the volatility of the stock market makes you too nervous to invest, that’s okay! There are multiple ways to invest your money and build wealth outside the stock market. Many know that diversity is important when it comes to investing in the stock market. That same philosophy applies to finding stock market alternatives that will help increase your net worth. All of the opportunities below are legitimate ways to build wealth outside the stock market to diversify your investments and make you less dependent on the market’s wild swings. There are a number of ways to invest in real estate. For instance, you can purchase single family homes and rent them out. You can purchase apartment complexes or commercial property. You can even invest in real estate through crowdfunding sites. Investing in real estate is one of the best ways to build wealth outside the stock market. Unfortunately, lack of funds can be a high barrier to entry for many individuals wanting to invest in real estate. The rise of crowdfunding sites has lowered that barrier, giving more people access to real estate investing options. Fundrise is one example of a real estate crowdfunding site. You can start investing for as little as $500 with Fundrise and you can invest in residential or commercial properties. Fundrise also allows you to invest money in either a retirement or non-retirement account so you can better match investments to your goals and needs. It’s important to note that real estate is a risky investment. However, there are ways to insulate yourself from potential market fluctuations, like paying for your rentals in cash. Some people who invest in real estate decide to manage their properties themselves. Others outsource to a property management company. Outsourcing prevents them from getting calls in the middle of the night about a broken dishwasher. If you can mitigate the need for your personal involvement, investing in real estate is one of the best residual income ideas as it allows you to earn income with little effort. You can also invest in real estate by renting out a room, or a second property on Airbnb. Check out our Airbnb host checklist to learn how you can make money renting your house or room. Peer-to-peer (P2P) lending has grown in popularity over the past few years. With P2P lending, you act as the bank by loaning money to other individuals that have need. In many cases, returns from P2P lending tend to be in the six to eight percent range. As a borrower, you can apply for a personal loan for a variety of reasons. These could include moving expenses, hospital bills, or debt consolidation. Much like a traditional bank, the interest rate you get as a borrower depends on a variety of factors including your credit history. According to an article in Forbes, “Compared to stock markets, P2P investments have less volatility and a low correlation.” However, do your research before choosing a P2P company as an investor. Pay close attention to the fees they charge you as well as their default rates. Doing this ensures that you’re making the wisest investment possible. If you’re looking for a way to earn income through P2P lending, LendingClub is one of the more reputable companies in the space. You can open a non-IRA account for as little as $1,000 (IRAs require $5,500) and can invest in loans with as little as $25. If you’d rather shelter the income earned from P2P investments, LendingClub offers retirement accounts for those wanting to avoid potential tax implications. If you have an entrepreneurial mindset, you might have business ideas all the time. If this sounds like you, why not think about building businesses as investments? For example, you can start businesses for the sole purpose of selling them in the future. You can do this on a either a small or large scale. I used this method by growing different websites and blogs from scratch and selling them once they had enough posts and traffic. I made anywhere from $400 to $4,000 per website! Think about that on a larger scale. You can build large, profitable companies and eventually sell them once they are valuable. Like any of the other ways to create wealth outside the stock market, this is not an opportunity without risk and one that has no guarantee. Have you ever watched “Shark Tank”? It’s one of my favorite shows. If you haven’t seen it, the show features several investors who hear pitches from entrepreneurs and decide whether or not to invest in their company. Investing in companies is something available to anyone with funds to invest. You can invest in a local shop who wants to raise money to expand. You can help your neighbor get their food truck started. The possibilities are endless and investing in startups is a strategy used by many millionaires as they seek to grow multiple streams of income. Traditionally, angel investors give money to business owners in exchange for equity in the company. This is a way for you to diversify your investments without putting in the blood, sweat, and tears as a business owner. Paying off debt isn’t that much of a stretch when it comes to trying to build wealth outside the stock market. When you pay off high-interest debt, you build wealth by saving money on interest payments. So, the more you pay off, the stronger impact it has on improving your net worth. 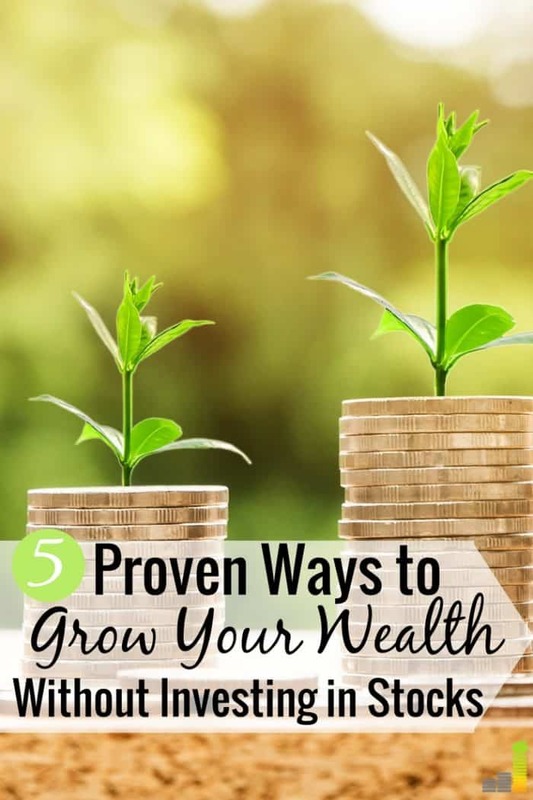 It can be argued that paying off debt is the most important part of building wealth outside the stock market since carrying high-interest debt will prevent you from pursuing other wealth building opportunities. If you have high-interest debt, you want to slash your rates so you can pay off the debt quicker. You can check possible rates with Even Financial to find a lower one. After filling out a super short application, Even Financial lets you compare up to 17 lenders to find the best match for your needs. Diversification is key when it comes to investing. Not every investment opportunity will be profitable so adding diversity to your investments will protect you from wild swings or declines in your investments. Adding additional streams to wealth creation not only protects you but it allows you to further wealth creation. Keep in mind the alternative investment ideas mentioned above aren’t necessarily better than the stock market. They’re just different. 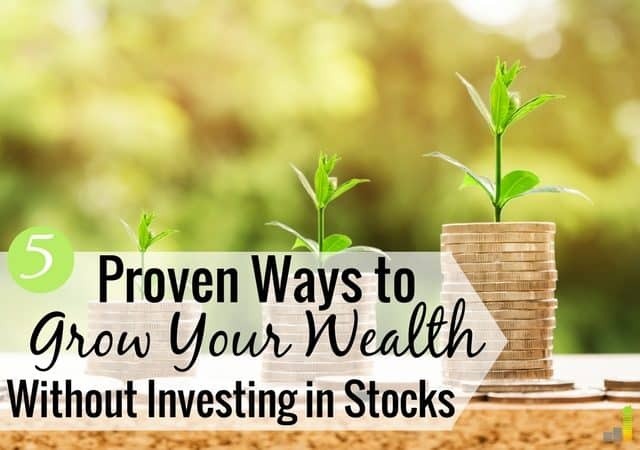 However, since people have different skills, risk tolerance levels, and available funds, it’s important to know the different ways of investing, and building wealth, outside of the stock market. What are some of your favorite ways to build wealth outside the stock market? Do you think it’s a good idea to invest in the business of a friend or family member? What stock market alternatives would you never consider investing in? The biggest proportion of my wealth has come from starting companies. For me, stocks are just a way to diversify my wealth but not necessarily a good way to build it. It’s good to diversify your wealth outside of just the stock market for sure. I am trying to build my website into something which will provide me with a little bit of income so hopefully that will be a success. Long term though, real estate is the way I want to go. There are a lot of opportunities for real estate to earn a good amount of money here in the UK, but as you mentioned funds are a heavily limiting factor for me right now. Good post! That’s great. I also love building websites and hope to have rentals someday. I’ve flipped websites in the past and it’s really a hit or miss but the potential is great. Another good idea is to hire a developer to develop a software and either sell it or find users. Currently working on one. Love these! I plan on purchasing another property eventually and renting my current house, then selling after I retire. I’ve known several people who’ve done similar things or who’ve downsized several times to supplement their retirement. I think it’s important to diversify your investments. That’s awesome Tawnya! Completely agreed, diversity is vital.